Larks Lake is a quiet, shallow, and largely pristine lake in northern Emmet County. Although moderately large in terms of surface area, depths are limited to just a few feet throughout much of the lake. Larks Lake is fed by springs and water flows out of the lake through Brush Creek on the southwest shore. Brush Creek flows into the West Branch of the Maple River, which flows into Burt Lake, and eventually through the Cheboygan River into Lake Huron. Popular recreational activities include fishing, boating, and swimming. The substrate on the bottom of Larks Lake is mostly muck and marl. Marl is a mixture of crumbly clay, sand, and accumulated calcium carbonate that is commonly found on the bottom of lakes in the Cheboygan River Watershed. The calcium carbonate is the result of the limestone bedrock of the region, which was formed long ago by coral reefs and the deposition of shells and skeletons of marine organisms in an ancient sea. Fossilized shells and polished fragments of corals (Petoskey Stones) commonly found in the area are relics of this time long gone. Larks Lake is important not just because of the recreational activities it provides; it is also a large source of water to the Pleasantview Swamp. At 6,544 acres, the Pleasantview Swamp is one of the largest uninterrupted wetlands in northern Lower Michigan. Because it is at the headwaters of the West Branch of the Maple River, the swamp is extremely important for protecting the water quality of this renowned trout stream. The Pleasantview Swamp also provides habitat for a magnificent variety of plant and animal life, including bobcats, black bear, otters, bald eagles, and osprey. In 2006 the Larks Lake Watershed Management Plan was written, with funding from the Petoskey-Harbor Springs Area Community Foundation and the Ann K. Irish Charitable Fund. The Plan provides a background of the Watershed, along with recommendations to protect the water quality of Larks Lake. Water testing on Larks Lake during the winter. Larks Lake is monitored every three years through the Watershed Council’s Comprehensive Water Quality Monitoring (CWQM) Program for dissolved oxygen, specific conductivity, pH, nitrate-nitrogen, total nitrogen, total phosphorus, and chloride levels. Water transparency, chlorophyll-a, and water temperature are also monitored in Larks Lake each summer by volunteers as part of the Watershed Council’s Volunteer Lake Monitoring (VLM) Program. This lake is monitored through the Little Traverse Bay Bands of Odawa Indians Surface Water Quality Protection Program (SWQPP). 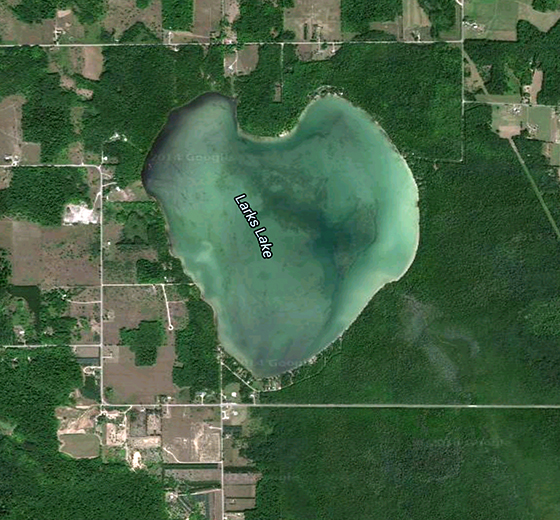 Data from Department of Natural Resources (DNR) and Department of Environmental Quality (DEQ) surveys of this lake can be accessed online in the Michigan Surface Water Information Management System (MiSWIMS).